Yesterday, we published a post ["23-Aug-18: New data: How the terrorists who bombed the Sbarro pizzeria fared financially"] focusing on the sums of money that, according to computations done by the fine team at Palestinian Media Watch (for whose input we are very grateful), have funded the lifestyles of the Sbarro bombing gang and, where relevant, their heirs. Those Sbarro-related payments stand at close to a million dollars and increase every month. And by the way, the massively corrupt Palestinian Authority, which pays out the cash granted to them, is perpetually insolvent. The incentive value of sums like those paid out, and continuing to be paid, month after month, in encouraging ever more Arab-on-Israeli terror is clear. Note also that the Fatah-controlled PA has had no problem in the past making payments to Hamas terrorists, even with the deep and frequently lethal rivalry that reigns among them. Abbas and Fatah bestowed the Al Quds Mark of Honor, the PLO’s highest medal, to Ahlam Tamimi (briefly profiled below) while she was imprisoned in an Israeli jail for her central role in the Sbarro massacre. As this source notes, "Conferring the Al Quds Mark of Honor is decided at the discretion of [Abbas] the Palestinian Authority’s president, and he alone has the final say when choosing the Palestinians to be honored with the medal." He later reversed the award because of the outcry that it attracted, but that doesn't change the point: payments and medals to terrorists and encouraging more terror remain a consensus issue in their deeply dysfunctional world. There's much to be learned from knowing more about those Hamas terrorists - what they did, what's become of them. It's regretable that even people relatively well-informed about Israel's experience at the hands of Palestinian Arab terrorists seem to be unaware of much of the detail below. We offer brief profiles of the terrorists named below - with the exception of the one who appears at the bottom of the list - all of whom took part in the 2001 Battle of the Sbarro Pizzeria (names are listed alphabetically by surname). We also note how they have fared since setting out to execute a massacre on a 'battlefield' deliberately chosen by the plot's barbaric mastermind, Ahlam Tamimi, for its attractiveness to Israeli children during their school holidays. Jamal Abu al-Hija: Headed Hamas’ military wing in the Samaria city of Jenin. In addition to his role in the Sbarro attack, he had direct involvement in the bombing of a full commuter bus traveling from Haifa to Tzefat at Meron Junction (9 killed, 38 injured, September 4, 2002). After being arrested and tried, he was sentenced to 9 life terms of life imprisonment plus 20 years. Career status: For now, continues to reside in an Israeli prison cell. Qeis Adwan: Emerging as a popular leader in the student union of the notorious An Najah National University in Nablus (they honored the Sbarro bombers by erecting an on-campus replica of the destroyed pizzeria the month after the massacre), he became a senior manager in the Hamas terror hierarchy. Described by the New York Times as an "inventive bomb maker", he is said to have taken responsibility for the murdering of no fewer than 77 Israelis. He played a managerial role in several of the most savage Hamas atrocities including the Sbarro massacre, the bombing of the Nahariya railway station (3 killed, 94 injured, September 9, 2001), the Passover bombing of Netanya's Park Hotel (29 killed, 64 injured, March 27, 2002), and the bombing of the Arab-run Matza restaurant in Haifa (16 killed, 40 injured, March 31, 2002). Career status: Permanently terminated by Israeli security forces in the northern Samaria city of Tubas on April 5, 2002. Izz al-Din Shuheil al-Masri: The human bomb planted by Hamas in general and Ahlam Tamimi in particular outside the Sbarro location. We described the circus-like spectacle of the very public funeral given to his remains here: "5-May-14: The making of a martyr: it takes more than a village". An extract from what we wrote: "Back in August 2001, starting just a day or two after the Sbarro massacre, al-Masri's father was 'marketed' to both the BBC and the Australian Broadcasting Corp as a lover of peace and as a worthy interview subject. We know this because both the [Australian] ABC and the [British] BBC approached us, astoundingly asking that we take part in double-headed interviews: on one side, the freshly-bereaved father [Arnold Roth] of a child blown up just a few days earlier by a human bomb; on the other, the parent of the human bomb himself. We declined both invitations with considerable puzzlement and anger. We soon had cause (as we wrote here) to wonder what kind of soul-less reporter thinks that sort of proposal is moral and professional. Are you reading this, Tim Palmer?" Worth mentioning that reports of payments being made to al-Masri's parents have never been in serious doubt since his father, Shuhail Ahmed Al-Masri, comprehensively blurted out the facts in a television interview with NBC [archived here]. It's likely that the regular payments to the voluble, proud and honored al-Masri parents from Arab Bank were separate from and in addition to the Martyrs' Fund payment they presumably still get until today from the Palestinian Authority. Career status: Permanently terminated when he pressed the detonator on his chest inside the pizzeria and the guitar case filled with nails and explosives did its horrible work. Abdullah Jamal Barghouti: Manufactured the explosives-packed guitar case that al-Masri, the human bomb, carried into the pizzeria. We describe Barghouti and his egregious barbarism in this post: "1-Jul-13: 66 acts of murder make him a hero in parts of the Arab world. What does this tell us about parts of the Arab world?" He's "the self-confessed murderer of 66 people including 9 in the July 2002 bombing at the Frank Sinatra Cafeteria of the Hebrew University of Jerusalem; 11 in the March 2002 bombing of Jerusalem's Cafe Moment; 10 in the December 2001 triple-bomb outrage on Jerusalem’s Ben Yehuda pedestrian mall; and 15 (most of them children, including our 15 year old daughter Malki) in the August 2001 massacre at Jerusalem's Sbarro pizzeria in August 2001." His most famous quote: "I feel bad because the number is only 66. This is the answer you want to hear? Yes, I feel bad because I want more." [Quoted on a CBS site]. At his trial, evidence was produced to show that Barghouti's high-profile relative (nominated for the Nobel Peace Prize with the enthusiastic backing of Desmond Tutu, a South African church figure) Marwan Barghouti - a prominent Palestinian Arab political figure now himself serving several life sentences for murder - paid Abdullah Barghouti $500 build the bomb. This came on top of the $117,000 he received for his troubles from Hamas, according to evidence given to the court. Career status: Currently serving a sentence of 67 terms of life imprisonment. Bilal Yaqub Barghouti: Recruiter and member of the Hamas cell and, according to Haaretz: “The senior Hamas activist behind the Sbarro restaurant bombing in Jerusalem, Bilal Barghouti, told interrogators that Marwan [Barghouti - the Nobel candidate] hid him for a few days while Israel was hunting for him and gave him a weapon when he left.” Convicted January 16, 2003 – sentenced to 16 terms of life imprisonment (see judgement), his only words to the court at the conclusion of his trial on terrorism charges, and this is a direct quote, were: "Thank God. I regret that I did not kill even more people than I did kill". Career status: Still in an Israeli prison. Ayman Adnan Muhammad Halawah: Also known as Iman Halaweh - a Hamas explosives expert. 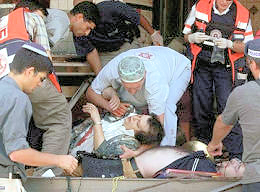 Took a lead role in the Sbarro assault, and was involved in other terror attacks on Israeli civilians including the March 28, 2001 attack on a group of boys waiting in the parking lot of the Neve Yamin gas station near Qalqilyah for a ride to their yeshiva in Kedumim (two were killed, one was critically wounded, another had moderate injuries) and the mass-casualty human bomb attack on the Tel Aviv beach Dolphinarium (June 1, 2001). Career status: Never arrested. Passed away from violent causes on October 22, 2001 - one source [Dawn] suggests Israeli forces were involved. Ahlam Aref Ahmad al-Tamimi: Since we have written literally hundreds of posts about this vicious embodiment of female savagery, we will be brief now. Born in Jordan in 1980; moved to Nabi Saleh, north of Jerusalem, in about 1998 to live there with fellow members of the notorious Tamimi clan. Then to Ramallah, while attending a nearby university, working as a part-time reporter and becoming the first woman terrorist in the ranks of the Hamas Islamists. Masterminded the bombing of the Sbarro pizzeria after selecting it for the large number of Jewish children it attracted. Arrested September 14, 2001; convicted by an Israeli court on September 23, 2003. A 2006 report quotes Tamimi saying from her Israeli jail cell: "I'm not sorry for what I did. We'll become free from the occupation and then I will be free from prison." Sentenced to 16 terms of life imprisonment. Released October 2011 in the catastrophic Shalit Deal. Career status: Freed in the Shalit Deal and "exiled" to where her parents and most of her siblings live: Amman, Jordan. She is there today, living with a husband, Nizar Tamimi, who is also an unrepentant murdering terrorist, in his case for Fatah, and their child. The husband also receives monthly payments from the Abbas regime. Ahlam Tamimi was added to the FBI's Most Wanted Terrorists list in March 2017; there is a $5 million prize for information leading to her arrest and conviction. She is not in hiding and for most of her years in Jordan she has been working in the service of Hamas, making a weekly TV program for them along with other special promotional appearsances. We are deeply into a campaign to have the US put real pressure on Jordan to extradite Tamimi under the 1995 Jordan/US Extradition Treaty. So far, Jordan has refused on grounds that we, and many of the experts we have considered, consider bogus and an embarrassment to Jordan's relations with the West. Finally, the case of Nizar Tamimi, Ahlam Tamimi’s cousin and since 2012 also her husband. Both husband and wife are unrepentant terrorist-murderers. Both walked free in the catastrophic Shalit Deal. And both are beneficiaries of the Palestinian Authority's disgraceful, foreign-funded Rewards for Terror scheme. They may be the only double-income terrorist family to qualify under the blood-soaked incentive scheme. Nizar Tamimi was convicted of the 1993 murder of Chaim Mizrachi, along with two other close Tamimi relatives. (Another member of the clan, Bassem Tamimi, father of media starlet Ahed Tamimi and uncle of Nizar, was also charged but released under strange circumstances. Nizar Tamimi was sentenced to life in prison but released October 2011 in the Shalit Deal. Career status: Nizar Tamimi now lives in Jordan with his wife Ahlam Tamimi and their family. How much has he earned from the Fatah/PA/PLO scheme so far? At least $92,057 from the time of his arrest until he walked free in the Shalit Deal. This is not included in the total on the PMW poster. What, if anything, did Nizar Tamimi earn from the PA in the nearly seven years after he walked free? The PMW experts say he would probably got a one-time release grant of $6,000 on top of the stipend he had been receiving during his 18 years behind bars. He would be entitled, as a released prisoner who served 15 to 20 years, to a privileged position and commensurate salary in the PA with the seniority of Colonel or higher. Calculating what this means in practice is complicated by the fact that he and his wife live in Jordan. "[T]he prisoners and the families of the prisoners themselves are actually paid a higher wage than what most Palestinians earn for nonviolent work... [P]ayments to terrorists' families are exceedingly popular these days. Ziad Asali, the president and founder of the American Task Force on Palestine, told me that in recent years the media and politicians have elevated these payments to something "sacred in Palestinian politics." Asali said the Palestinian Authority president, Mahmoud Abbas, and others are too weak to stop it. "This is where we find ourselves now. The vast majority understand there has to be an end to violence; it's not serving the Palestinians in any way," Asali said. "But I think nobody really has the stature and clout to confront these issues publicly." We're less disposed to seeing Abbas' actions as due to lack of stature or clout. in the words of a recent Jerusalem Post analysis. “disguise the fact that it is the PA that finances the payments to imprisoned and released terrorists... This institution was made subordinate to the PLO [instead of to the PA] in order to mislead the donor countries.” [source]. Meaning the incentive scheme for more terror is once again openly included in the PA budget. Reflecting the state of mind of the somewhat-dried-out Mahmoud Abbas, they no longer demonstrate any visible concern about being criticized. They do however care about Palestinian Arab public opinion. And their voters - little reported but demonstrably true - want more incentives for terror, not less. Which surely means more terror ahead, not less. Non-trivial footnote: The scale of the Abbas regime's investment in the Sbarro Massacre savages grows each and every month.